The research is one of a number of studies that have used stem cells – the body’s master cells – to grow ‘organoids’, 3D clusters of cells that mimic the behaviour and function of specific organs within the body. Other recent examples have been ‘mini-brains’ to study Alzheimer’s disease and ‘mini-livers’ to model liver disease. Scientists use the technique to model how diseases occur and to screen for potential drugs; they are an alternative to the use of animals in research. Cystic fibrosis is a monogenic condition – in other words, it is caused by a single genetic mutation in patients, though in some cases the mutation responsible may differ between patients. One of the main features of cystic fibrosis is the lungs become overwhelmed with thickened mucus causing difficulty breathing and increasing the incidence of respiratory infection. Although patients have a shorter than average lifespan, advances in treatment mean the outlook has improved significantly in recent years. 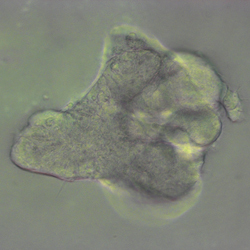 Using these cells – known as induced pluripotent stem cells, or iPS cells – the researchers were able to recreate embryonic lung development in the lab by activating a process known as gastrulation, in which the cells form distinct layers including the endoderm and then the foregut, from which the lung ‘grows’, and then pushed these cells further to develop into distal airway tissue. The distal airway is the part of the lung responsible for gas exchange and is often implicated in disease, such as cystic fibrosis, some forms of lung cancer and emphysema. The genetic mutation delta-F508 causes the CFTR protein found in distal airway tissue to misfold and malfunction, meaning it is not appropriately expressed on the surface of the cell, where its purpose is to facilitate the movement of chloride in and out of the cells. This in turn reduces the movement of water to the inside of the lung; as a consequence, the mucus becomes particular thick and prone to bacterial infection, which over time leads to scarring – the ‘fibrosis’ in the disease’s name. Using a fluorescent dye that is sensitive to the presence of chloride, the researchers were able to see whether the ‘mini-lungs’ were functioning correctly. If they were, they would allow passage of the chloride and hence changes in fluorescence; malfunctioning cells from cystic fibrosis patients would not allow such passage and the fluorescence would not change. This technique allowed the researchers to show that the ‘mini-lungs’ could be used in principle to test potential new drugs: when a small molecule currently the subject of clinical trials was added to the cystic fibrosis ‘mini lungs’, the fluorescence changed – a sign that the cells were now functioning when compared to the same cells not treated with the small molecule. The research was primarily funded by the European Research Council, the National Institute for Health Research Cambridge Biomedical Research Centre and the Evelyn Trust. Hannan, NR et al. Generation of Distal Airway Epithelium from Multipotent Human Foregut Stem Cells. Stem Cells and Development; 10 March 2015.